(ii) No, these numbers cannot be the lengths of the sides of a triangle because the sum of any two sides of a triangle is always greater than the third side, which is not true in this case. (i) In triangle APB, AP < AB + BP because the sum of any two sides of a triangle is greater than the third side. 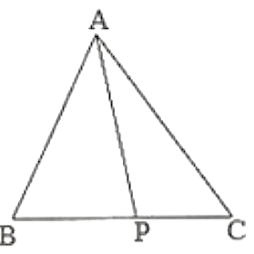 (ii) In triangle APC, AP < AC + PC because the sum of any two sides of a triangle is greater than the third side. We know that the sum of any two sides of a triangle is greater than the third side: it is not true for the given triangle. We know that the sum of any two sides of a triangle is greater than the third side: it is true for the given triangle. In ∆ABC, ∠B = 30°, ∠C = 50°. Name the smallest and the largest sides of the triangle. Because the smallest side is always opposite to the smallest angle, which in this case is 30°, it is AC. Also, because the largest side is always opposite to the largest angle, which in this case is 100°, it is BC.